Aflame for solo viola, composed for the 50th Anniversary of the Cleveland Composers Guild. First performance, Mark Jackobs, violist (the Cleveland Orchestra), Cleveland Hts., OH, 23 April 2010. Twin Spirits for two trumpets and piano, commissioned by Shaun Fontaine for the birth of his twin sons, Gavin and Cooper. First performance, Amanda Bekeny, Jane Rackley, trumpets and Kim Bakkum, piano, Akron, OH, 21 February 2010. Malambo Nouveau for piano, significantly expanded and reworked from the earlier Malambo. First performance by Grammy award-winning pianist Angelin Chang, 13 September 2009, Steinway Society of Western Pennsylvania, Pittsburgh High School of the Creative and Performing Arts, Pittsburgh, PA.
"His art is on the highest level and I cannot imagine anyone not liking it." —Bob Briggs, Music Web International, U.K.
“A composer of diverse coloristic gifts. Inhabits sound world(s) of . . . vivacity and lyricism . . . poignancy . . . and dark, swirling drama. The London Symphony Orchestra and conductor JoAnn Falletta are first-rate champions of Gallagher's creations. Grade: A." "Do you want optimistic exuberance? Go to the Diversions Overture. Poignancy? The liltingly lovely Berceuse. Music does not get much lovelier than this. Vivacity? The Sinfonietta for strings. The Symphony in One Movement: Threnody pretty much has it all. I highly recommend this CD. You will think you have been cheated that you have not heard it before." "Irresistible rhythmic élan and not a little wit, exhilarating in its effect. Powerful and deeply felt." 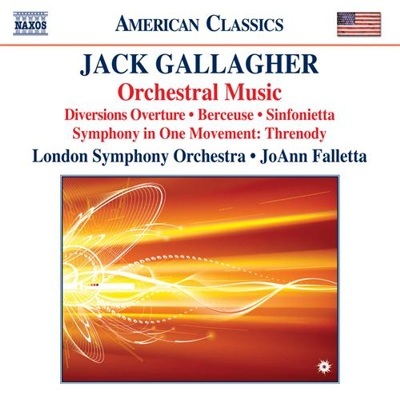 CD release by Naxos American Classics of Jack Gallagher: Orchestral Music, recorded at Abbey Road Studios by the London Symphony Orchestra, JoAnn Falletta, conductor and Michael Fine, producer. JoAnn Falletta will conduct the Virginia Symphony in two performances of Berceuse at St. Bede's Catholic Church in Williamsburg (24th) and Regent University Theatre in Virginia Beach (26th) at 8:00 p.m.
Grammy award-winning pianist Angelin Chang, head of keyboard studies at Cleveland State University, will record part II of the piano works of Jack Gallagher for forthcoming publication on CD. David Yost, recording engineer of Dr. Chang's Grammy-winning recording of Messiaen's Oiseaux exotiques, will engineer the disc. Mixing by Michael Fine of the forthcoming CD of Gallagher orchestral works, recorded at Abbey Road Studios by the London Symphony Orchestra, JoAnn Falletta, conductor and Michael Fine, producer. The CD is scheduled to be released in late 2010 on the Naxos label. 9 June 2009, 8:00 p.m.
Robert Sullivan, Principal Trumpet of the Cincinnati Symphony Orchestra, and Julie Spangler, pianist, will give the first performance of Remembrance of Robin at Werner Recital Hall of the Cincinnati College-Conservatory of Music. The 11-minute work, for trumpet in C and piano, was commissioned by Mr. Sullivan in memory of his wife, an untimely victim of sarcoma. The program will benefit the Sarcoma Foundation of America. 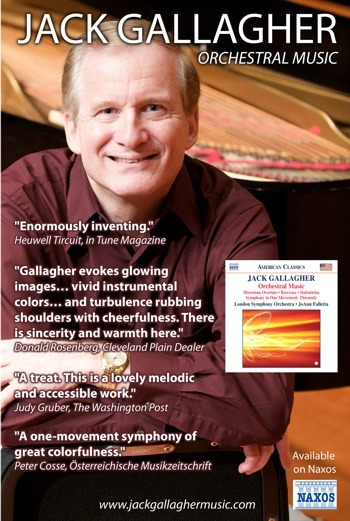 Grammy award-winning pianist Angelin Chang, head of keyboard studies at Cleveland State University, will record the piano works of Jack Gallagher for forthcoming publication on CD. David Yost, recording engineer of Dr. Chang's Grammy-winning recording of Messiaen's Oiseaux exotiques, will engineer the disc. Completion of the second edit of the forthcoming CD of Gallagher orchestral works, recorded at Abbey Road Studios by the London Symphony Orchestra, JoAnn Falletta, conductor and Michael Fine, producer. The CD is scheduled to be released in late 2010 on the Naxos label. 24 March 2009, 8:00 p.m. Ancient Evenings and Distant Music performed by the University of Mississippi Faculty Woodwind Quintet at Nutt Auditorium, The University of Mississippi. Resonances, for trumpet ensemble, performed for Finals of the National Trumpet Competition by the Boston University Trumpet Ensemble 1 at Harris Theatre, George Mason University, Fairfax, Virginia. Dance No More (Thomas Chatterton) presented by The Wooster Chorus, Gregory Brown, Director, at Spring Tour performances in Indianapolis, St. Louis, Chicago Heights, Urbana, Cincinnati, and Lima, Ohio. Let Me Make Songs performed at Southern College Music Society Conference, University of Central Florida, by Nancy Maria Balach, soprano, John Schuesselin, trumpet, and Amanda Johnston, piano. Ancient Evenings and Distant Music performed by the Chinook Winds Quintet for the Great Falls Symphony Chamber Music Series at C.M. Russell Museum and elsewhere, Great Falls, Montana. Copyright © 2008-17 Jack Gallagher Music. All Rights Reserved | Photo credits: Matt Dilyard | Site by Leitmotif.